Transitions are animations that appear between PowerPoint slides when you advance from one slide to the next during your presentation. Examples of transitions include a slide dissolving into the next slide, a slide pushing the previous slide off-screen, and so on. 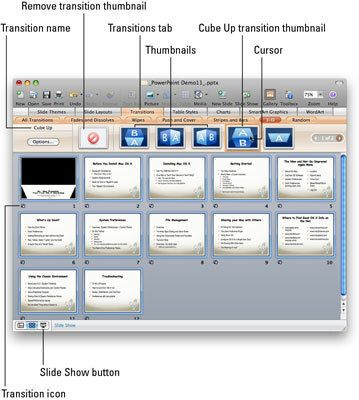 PowerPoint includes more than 50 different transitions. Used wisely, transitions can make your PowerPoint presentation look even more impressive. It’s usually a good idea to use the same transition throughout your presentation. Using the same transition not only gives your presentation consistency, but also makes it look more professional. The exception to this rule is that many presentations have one slide that deserves to have attention called to it. Sometimes, it makes sense to use a different transition to introduce that special slide. But, most of the time, you’ll look more professional if you use only one transition throughout your whole presentation. You can also decide to use no transitions between slides. If you don’t use any transition, when you click to advance to the next slide, the next slide replaces the current slide instantly with no animation. Switch to either Normal view (choose View→Normal) or Slide Sorter View (choose View→Slide Sorter). It’s usually easier to apply transitions in Slide Sorter view, which allows you to see more slides and provides feedback on which slides have transitions. Select slides you want to use the transition. To select multiple slides, you click the first slide and then hold down either the Shift key (to select contiguous slides) or the Command key (to select noncontiguous slides). After you click any slide, you can select the rest of the slides in the presentation all at one time by choosing Edit→Select All or pressing Command+A. If you’re using Normal view and objects on your slide get selected, instead of all the slides in the left pane, click a slide in the left pane before you choose Edit→Select All (or before you press Command+A). With some or all of your slides selected, click the Transitions tab in the Elements Gallery. Move the cursor over any of the transition thumbnails, and its name will appear. Click a thumbnail, and the theme is applied to all slides that are selected. When you click a thumbnail, you see a thumbnail-sized preview of the transition on the first selected slide. Slides that have transitions applied to them display a little icon below their bottom-left corner. To preview your transition, click the Slide Show button or choose View→Slide Show. Click anywhere to advance from one slide to the next. When you’re finished, press the Esc key to return to the Normal or Slide Sorter view. If you didn’t apply this transition to all your slides, apply one to all your slides now. Transitions work pretty much the same as themes and layouts. Click a thumbnail to apply the transition (theme, layout) to the selected slides.